Venezuelan President Nicolas Maduro said he canceled his plan to take part in the U.N. General Assembly in New York to "protect my life" after purported threats. Maduro, who is back in Venezuela after a visit to China, said Wednesday that on a layover in Vancouver he received intelligence on what he said were "two highly serious provocations," which prompted him to scrap his U.N. trip. "When I got into Vancouver I evaluated the intelligence which we received from several sources. I decided then and there to continue back to Caracas and drop the New York trip to protect a key goal: safeguarding my physical integrity, protecting my life," Maduro told local media. One of the alleged provocations "had been planned against my physical integrity" and another could have involved violence in New York, the leading face of Latin America's left charged. Maduro, speaking from an automobile plant, said that he would not reveal details of the plot so as not to compromise his information source. He said he found it difficult to believe that President Barack Obama was not aware of the alleged plot. Sudan's fugitive president Omar al-Bashir will not attend the U.N. General Assembly, a U.N. official said Thursday, amid ongoing violence in the country's capital of Khartoum. 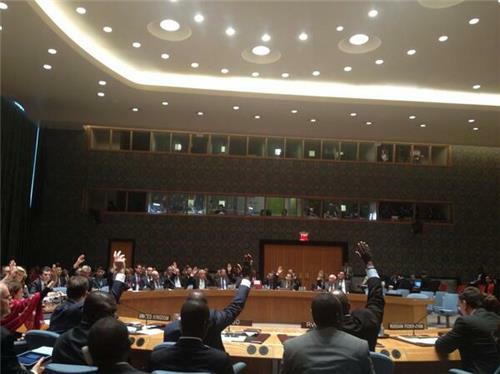 A U.N. official told Reuters by email that Bashir - who is wanted by the International Criminal Court (ICC) on charges of orchestrating war crimes and genocide in the Darfur region of Sudan - would not be coming to New York, but did not provide further details. Bashir's absence at the General Assembly comes as the death toll from days of rioting in Sudan’s capital Khartoum continues to climb. The protests against a government decision to scrap subsidies on fuel have killed at least 29 people, medical officials have said. The fact there was no handshake between President Barack Obama and Iran's President Hassan Rouhani on the sidelines of the U.N. General Assembly in New York Tuesday may have seemed like an anti-climax, given the frenzy of media speculation surrounding the prospect of a meeting between the two men. But even without the symbolic boost of the first confab between the presidents of the rival powers since the 1979 Islamic Revolution, renewed diplomacy to address the nuclear stalemate has not stalled. 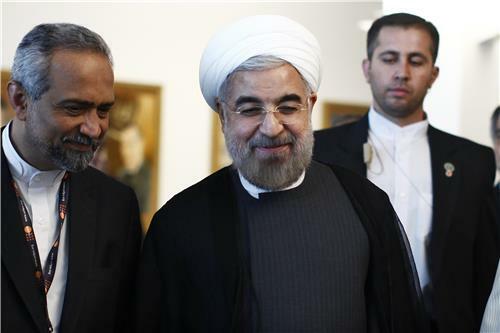 Rouhani and Obama could have encountered one another at a lunch for world leaders hosted by U.N. Secretary General Ban Ki-Moon Tuesday, but the prospect of diplomatic chatter at a meal where alcohol was served provided a reason for Rouhani to stay away, Iranian state media reported. A number of Iran-watchers, however, saw Rouhani's avoidance of an encounter with Obama as a reminder of the domestic political challenges the Iranian leader faces in selling engagement with the U.S. to more hawkish elements in Tehran. But while the handshake would have been a profoundly important symbolic gesture, it would have been solely that. Thursday's planned meeting between U.S. Secretary of State John Kerry and his Iranian counterpart, Mohammed Javad Zarif, however, will occur in a more substantial negotiating session. Both leaders are slated to be present at a meeting of Iran and the P5+1 group -- the U.S., Britain, France, Germany, France, Russia and China -- which has been locked in fruitless talks over Iran's nuclear program since 2006. Should both show up, theirs would be the first meeting since May 2007 between an American secretary of state and an Iranian foreign minister. 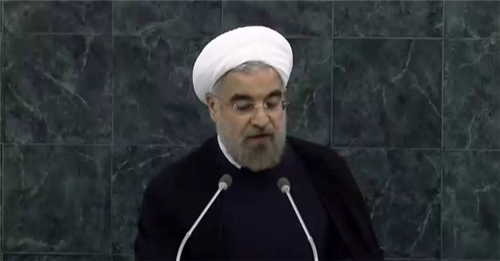 Speaking before a meeting on nuclear non-proliferation at the United Nations General Assembly, Iranian President Hassan Rouhani declared that "any use of nuclear weapons is a violation of the UN charter and a crime against humanity." In his role as the head of the Non-Aligned Movement (NAM), Rouhani called for a total destruction of nuclear weapons, lamenting that four decades of international efforts to establish a nuclear weapon-free zone in the Middle East have regrettably failed. 'The world has waited too long for nuclear disarmament," said Rouhani, emphasizing that nuclear weapon states have primary responsibility for driving disarmament in the international community. "As long as nuclear weapons exist, the threat of their use exists." Rouhani added that Israel should join the Non-proliferation Treaty 'without delay' to help establish a nuclear-free zone in the Middle East. 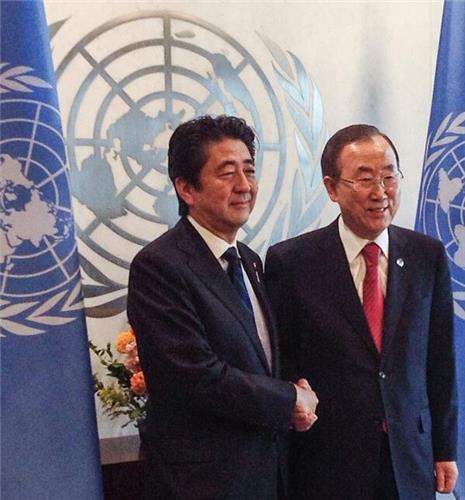 He called upon the UN to convene a high-level international committee on nuclear disarmament in the next five years. Sudan's foreign ministry denied Thursday that President Omar al-Bashir, who faces an international arrest warrant, has called off a trip to New York to address the United Nations General Assembly. Zimbabwe's President Robert Mugabe berated the United States and former colonial power Britain at the UN General Assembly Thursday for trying to control his nation and its resources. "Shame, shame, shame to the United States of America. Shame, shame, shame to Britain and its allies," said Mugabe. "Zimbabwe is for Zimbabweans, so are its resources. Please remove your illegal and filthy sanctions from my peaceful country." 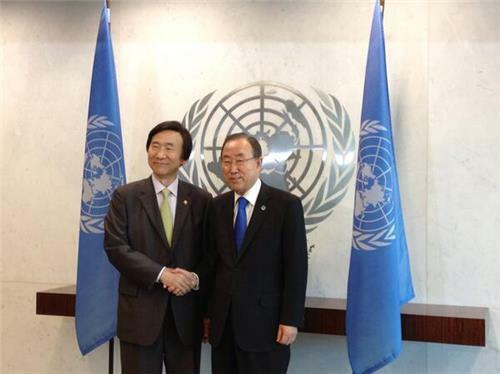 bit.ly/18sE3fA #UNSG meets with Foreign Minister AMOFAkr_eng of #ROK to discuss Syria situation and Korean Peninsula. A senior State Department official tells Al Jazeera's Benedict Moran that government officials "do not anticipate" that any issues regarding Iran's nuclear program will be resolved during Thursday's P5+1 meeting. "We hope that this new Iranian government will show that it is prepared to engage substantively to address these long standing concerns and we will see today and in months ahead whether they will follow words with action," the official said. Well, thank you very much (inaudible). Thank you, and I apologize to all of my colleagues for being a little bit late. I’m sorry about that. 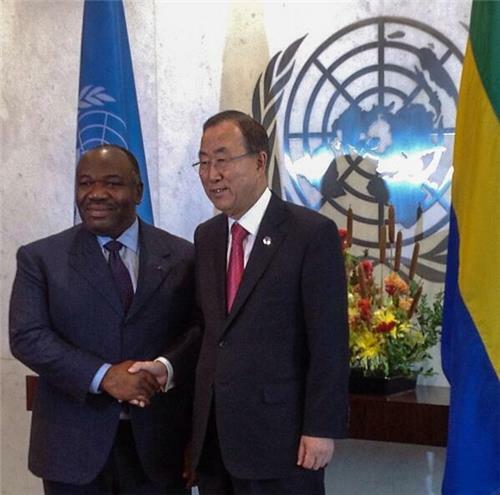 We also believe the United Nations is a powerful platform to advance our support for the human rights of LGBT persons. Advancing equality for LGBT persons isn’t just the right thing to do. It’s also fundamental to advancing democracy and human rights, which are at the foundation of American foreign policy, and I think the foreign policy of most of our colleagues, if not all of our colleagues here. We all know that as societies become more inclusive, they become better partners within the global community, and they become partners, all of whom are joined together by common values and common interests. That is why we put such weight behind the unprecedented Human Rights Council resolution two years ago affirming LGBT rights. It’s also why we co-authored, along with Colombia and Slovenia, a joint statement in support of these efforts that was signed by 85 UN members. But this moment has to be more than a moment to simply celebrate how far we have come, or the historic nature of this particular event. When people continue to be harassed, arrested or even murdered simply because of who they are or who they love or what they believe, how their lives are organized and structured, then we have to recommit to our work together. In too many places around the world, LGBT persons are still punished for simply exercising their fundamental rights and freedoms. The Global Equality Fund is one way in which likeminded countries can address this injustice and show their support for LGBT persons. Since the United States launched the Fund in 2011, it has allocated over 7 million in more than 50 countries worldwide. And the investments have helped to challenge the discriminatory laws that undermine human rights and bolster – and to bolster civil society organizations that defend those rights. With support from a range of likeminded governments, including Netherlands, Norway, France, Germany, Iceland, Finland, Denmark, and private sector partners as well, we are expanding the scope of the programs that this Fund supports. Earlier this month, President Obama and the Prime Minister of Sweden Fredrik Reinfeldt announced an additional $12 million for this effort. And today, I’m happy to announce another 1 million contribution from The Netherlands, and we’re grateful to you for that. We hope that every ally of LGBT persons around the world, including governments and corporations, are going to join us in this important work. And it’s very, very clear that if we continue to work as we have been, if we come together at events like this and others, we do send a message of solidarity with LGBT persons around the world, and we strengthen their ability – some of them in very tough places – to be able to exercise their fundamental human rights. As we think about our work ahead, we would do well to remember the fundamental challenge of the United Nations. Nearly 70 years ago, this body was created, quote, “to promote social progress and better standards of life, in larger freedom.” There are few areas where I think our task is so clear, and what we need to do is make sure that we are working for that larger freedom for all people, and for the rights and the dignity of LGBT persons around the world. 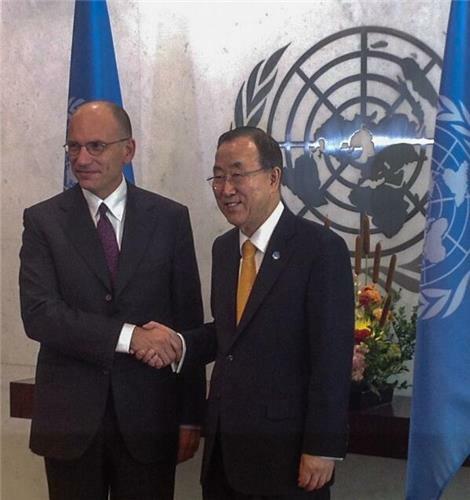 Security Council will meet at 8pm tonight on draft resolution on #Syria chemical weapons, closed consultations. EU foreign policy chief Catherine Ashton says Iran, world powers have agreed to substantive nuclear talks on October 15th and 16th in Geneva. Ashton also said Iran can either respond to the major powers' existing nuclear proposal or "make a proposal of its own." 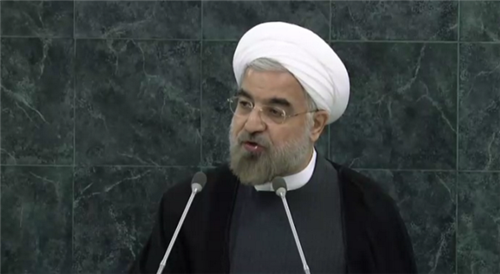 Ashton added that 12 months is 'a good period of time' for Iran to think about implementation of nuclear measures. EU's Catherine Ashton confirms P5+1 and #Iran will meet Oct in Geneva nuclear talks. Says convo was "energetic" but have to be "practical"
The tone and spirit of a meeting on Thursday between six world powers and Iran on Tehran's nuclear program was "extremely good," British Foreign Secretary William Hague said. Hague made the comment after the meeting he attended with Iranian Foreign Minister Mohammad Javad Zarif and counterparts from the United States, France, Russia, China and Germany on the sidelines of the U.N. General Assembly in New York. 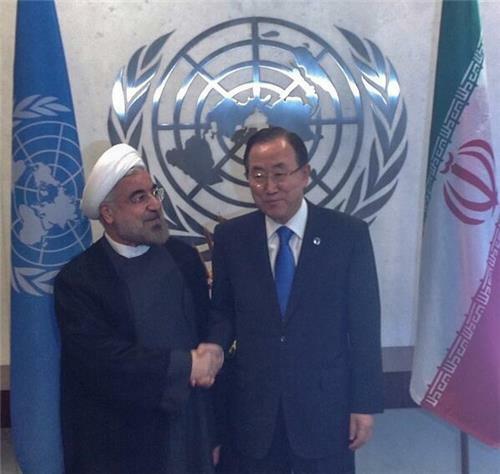 The talks were aimed at jump-starting efforts to resolve a decade-long standoff over Iran's nuclear ambitions. After meeting one-on-one with Iran's foreign minister, Secretary of State John Kerry says he is pleased with a new positive tone from Iran on talks over its nuclear program. But, he says one meeting with Foreign Minister Mohammad Javad Zarif is not going to resolve international concerns about Iran's nuclear intentions. Kerry said Thursday that Iran had to demonstrate its willingness to come clean about its nuclear program with actions. Kerry spoke after he and the foreign ministers from the other four permanent members of the U.N. Security Council and Germany met with Zarif on the sidelines of the United Nations General Assembly. Kerry and Zarif then met privately for a short time.